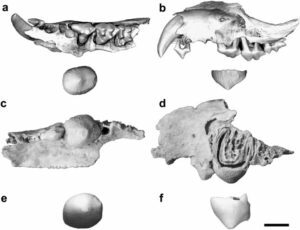 In May (2016), a [study] was published describing a new marsupial from Australia with an interesting set of teeth. Let’s dive right in! Firstly, what is a marsupial? A marsupial is a type of mammal that has a pouch. 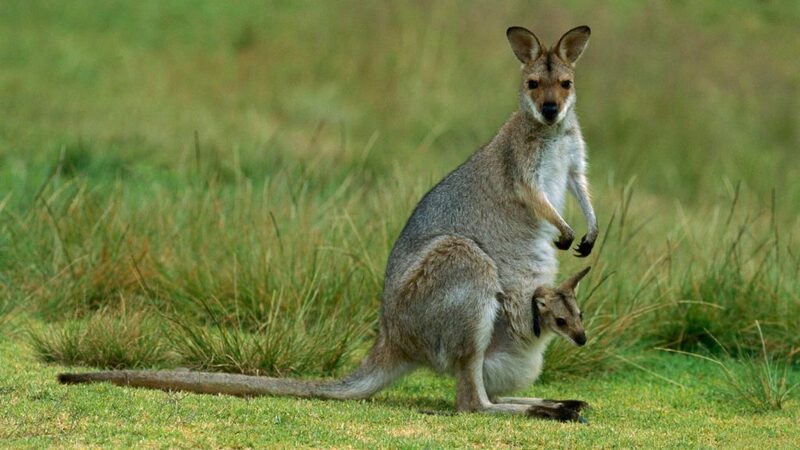 When a marsupial baby is born, it crawls into the mom’s pouch to continue growing before it’s ready to live in the world. When most mammals are born, they are instead born straight into the world, and their parents take care of them until they are ready to live on their own. This type of mammal is called placental, and humans belong to this group. 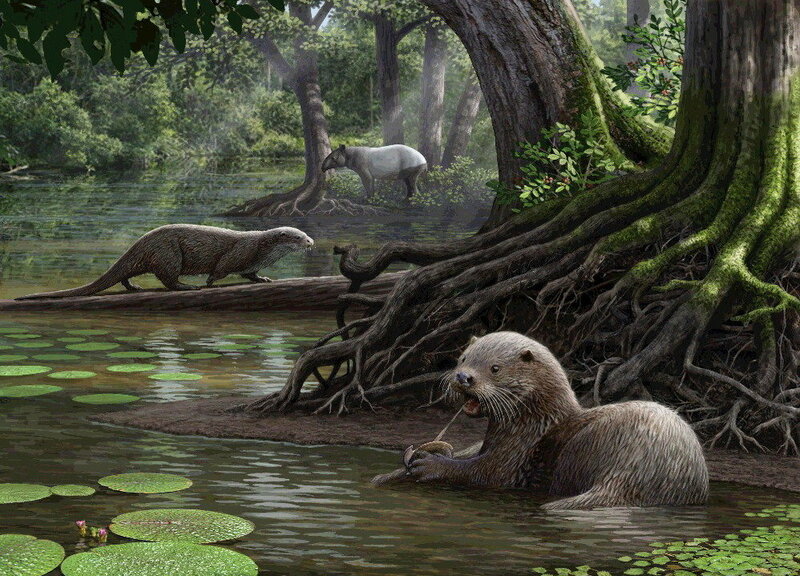 A few mammals still lay eggs, but that’s a story for another day. Marsupials live in the Americas and Australia and come in a variety of shapes and sizes. Interestingly, marsupial and placental mammals seem to be copying each other in living environments, diets, and lifestyles. There are burrowers, fast-movers, tree-dwellers, large herbivores, and carnivores in both marsupials and placentals. There were even marsupial lions and wolves (see video at the bottom)! 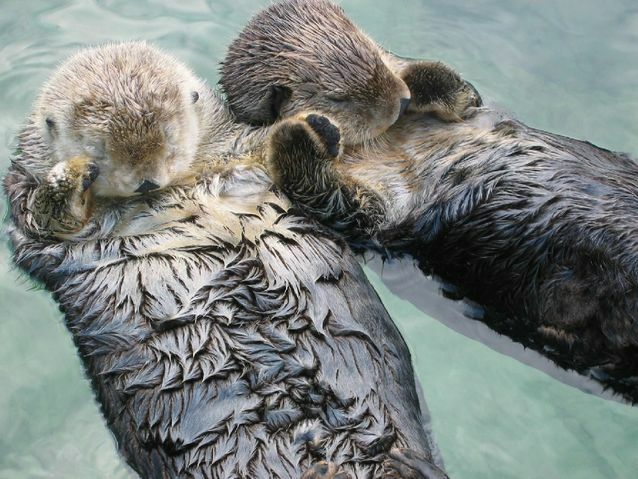 This is an example of convergent evolution, where animals get the same characteristics independently of each other. Similar ‘niches’ or lifestyles in placental and marsupial mammals. Even more interestingly, there are no aquatic or flying marsupials (so nothing like a marsupial whale or bat) because having a pouch makes those environments difficult to live in. Now that we know what a marsupial is (and how cool they are!) we can talk about the new one. The fossil, Malleodectes mirabilis (meaning “hammer-tooth”), was found in the Northwest of Queensland, Australia, in rocks of Miocene age (around 14.6 million years ago). It is a left maxilla (the bone that holds teeth in the upper jaw) and it preserves several teeth, including one that had not yet come up. Figure 4 from the paper. A and B showing the new specimen and it’s unique tooth. C, D, E, and F showing the other Malleodectes specimens and teeth. Teeth are really important in mammal paleontology because each species has its own unique set of bumps so you can identify species from only finding individual teeth. This fossil has a tooth still in the jaw that is cone-shaped, with a wide base and a small point. The same type of tooth found in other animals that eat snails. The shapes of the other teeth tell us that this animal was able to eat other types of food as well. 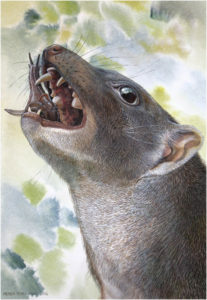 This combination of tooth types tells us that Malleodectes was the only mammal able to take advantage of this variety of diet in Australia’s Miocene rainforests and makes it completely unique. Video of a Thylacine, the Tasmanian Wolf, also known as the Tasmanian Tiger.